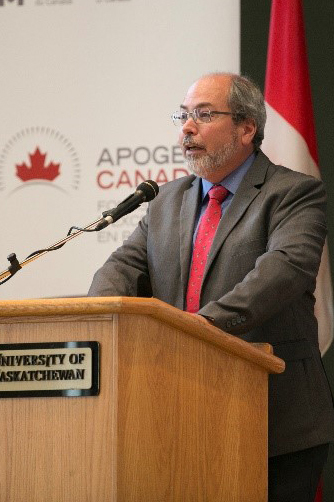 Dr. John Pomeroy is Director of the Global Water Futures Program – the largest university-led freshwater research project in the world. At the University of Saskatchewan he is the Canada Research Chair in Water Resources and Climate Change, Distinguished Professor of Geography, Director of the Centre for Hydrology, Director of the Coldwater Laboratory, Canmore, Alberta and Associate Director of the Global Institute for Water Security. He is a Fellow of the Royal Society of Canada, the American Geophysical Union and the Royal Geographical Society, was the 2017 recipient of the J Tuzo Wilson Medal from the Canadian Geophysical Union and serves as Institute Professor of the Biogeoscience Institute of the University of Calgary and Adjunct Professor of the University of Waterloo. He leads the International Network for Alpine Research Catchment Hydrology project of the Global Energy and Water Exchange Project for the World Climate Research Programme. Pomeroy has led several international initiatives such as the International Commission for Snow and Ice Hydrology, the IAHS Decade on Prediction in Ungauged Basins, and national groups such as the IP3 Cold Regions Hydrology Network, the Drought Research Initiative and the Canadian Geophysical Union. He has served as Research Scientist, Professor, Visiting Professor and Honorary Professor to the USDA Forest Service, Environment Canada, University of Wales, Chinese Academy of Sciences and University of Aberystwyth. Dr. Pomeroy has authored over 300 research articles and several books that have been cited over 13,200 times. His current research interests are on the impact of land use and climate change on cold regions hydrology and water quality, and improved prediction of climate change impacts, especially floods and droughts.